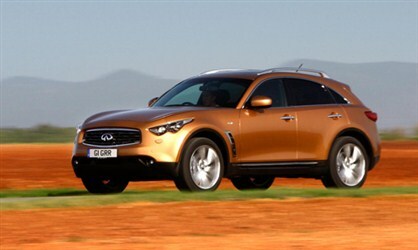 Infiniti FX50S is a full-size crossover SUV with a 5.0 l V8 engine and a power of 390 hp at 6.500 rpm. This beautiful car has six-speed paddle-shift automatic transmission and variable four-wheel drive with active all-wheel steering. The standard S variant comes on 21-inch alloy wheels and it is amongst the lightest of its peers at 2,120kg. Officials from Infiniti told that FX50S returns 21.6 mpg combined, while emitting 307g/km CO2 emissions.